With technology disrupting many traditional business models and organic growth hard to come by in a post GFC environment, more organisations than ever are pursuing growth outside of their core business. A clear majority of executives say their companies are pursuing growth in categories outside their core business—and report a strong belief that doing so has created company value. 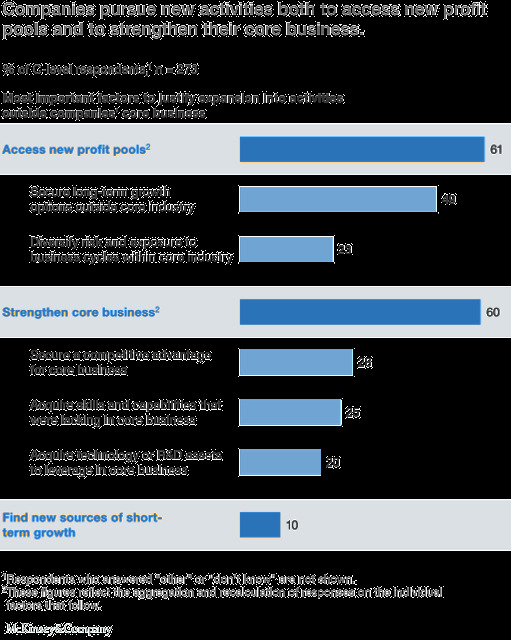 But a McKinsey Global Survey suggests that over time, companies’ aspirations to grow through these activities have produced only modest results and that few companies have the right practices in place to support such growth.1 These are the key findings from a survey on how companies expand into product or service categories beyond their core business. Nearly nine in ten respondents say that in the past five years, their companies have either pursued at least one activity in a new category, have considered it, or plan to do so in the next five years.